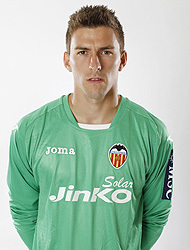 Arsenal FC are reportedly interested in Valencia CF goalkeeper Vicente Guaita. Arsenal FC have had troubles with their goalkeepers this season, as no one has managed to impress Arsene Wenger, so the Frenchmen is keen to bring in a quality goalkeeper in the winter transfer window. Arsenal manager Arsene Wenger has money to burn as he has been running the team with profit each year for several years now and even in older times, which is why Arsenal were able to build a new stadium, though they also found financiers as well. But more importantly Vicente Guaita hasn't been the happiest as his contribution has been limited and Diego Alves is the first choice. The problems started with Vicente Guaita getting injured and repeatedly having injuries, through which he would loose his starting place and end up not playing for long periods even when fully healed. Valencia CF president also knows he is going to be forced to sell someone in the summer transfer, though he would like to keep Guaita as he is Spanish and he is facing presidential re-elections and he has been accused of not having many Spanish players in the club, which is actually true. He might not have much choice though, as Vicente Guaita has a buyout clause of 15 million euros and Arsenal FC can certainly afford that kind of low price for a quality goalkeeper like Guaita. In fact Manchester United payed 22 million for De Gea, so 15 million would be pocket change for Arsenal for an even better goalkeeper. If Valencia CF looses Guaita the fans, especially the Spanish ones are not going to be happy. I'm not going to be happy, as I'd like Guaita to stay over Diego Alves as Guaita is a Valencianista and has been at the club for all his life. I also would want to loose him in the winter, as that would create a bad situation trying to find a replacement in such a short time, when Valencia is already having troubles finding replacements for Gago. I do have good news though and I can say that the Sporting director, Llorente and the staff have identified 2 new reinforcements that are fairly certain will go through and have been kept under wraps. So while we are in a search for a new defensive midfielder, two reinforcements have already been decided and the staff have quietly been working of securing the transfers.